The speculation and conjecture that accompany a Fed Cup or Davis Cup week mostly disappear once the draw ceremony is completed and the match-ups are determined. The draw for the Canada – Netherlands World Group II first round will be done on Friday at the Maaspoort arena in Den Bosch where the best-of-five match tie begins Saturday at 1 p.m. (7 a.m. ET in Canada) with the opening singles. It’s always tricky to make assumptions based on who practices with whom and when, but it appears Dutch captain Paul Haarhuis (above with Bibiane Schoofs) will go with his No. 1, Arantxa Rus (No. 129), and No. 150-ranked Richiel Hogenkamp, as the singles players. Rus (above), 28, and the 26-year-old Hogenkamp are the most experienced players on the Dutch team and practiced together on Thursday afternoon. As for Canada, it will very likely be No. 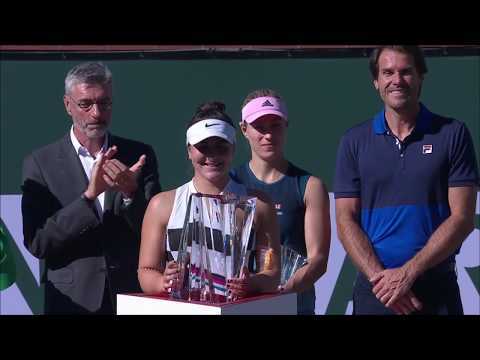 1 Bianca Andreescu (No. 70) and Francoise Abanda (No. 223) in singles. The other options for the second singles would be No. 209 Rebecca Marino or doubles ace Gabriela Dabrowski who ranks No. 445 in singles. Andreescu, and especially Abanda, are more experienced in Fed Cup action and there’s a feeling that Abanda has the ability to rise to the occasion when she’s representing her country. Two years ago in April, 2017, she defeated No. 31 Yulia Putintseva and No. 51 Yaroslava Shvedova as Canada beat Kazakhstan in a World Group II Playoff tie in Montreal. A year ago in April when she was the Canadian No. 2 behind Genie Bouchard, Abanda famously took a tumble and hit her head while warming up just minutes before she was to play Lesia Tsurenko of Ukraine in a World Group II Playoff in Montreal. Andreescu was the last-minute replacement. Canadian team coach, former world No. 3 Nathalie Tauziat (on right above with captain Heidi El Tabakh), has had her eye on the opposition this week and commented, “I know a few of them that I’ve watched play,” she said. “The three of them – Rus, Hogenkamp and Schoofs – I know their games a bit, and on clay as well. I’m not sure who’ll play. Rus is their No. 1 but they’re all pretty close in the rankings so you never know. In terms of head-to-heads, Rus has played neither Andreescu (above with strength and conditioning coach Clément Golliet) or Abanda while Hogenkamp is 1-1 (2018 matches) with Andreescu and 1-0 (a 2016 match in Mexico) against Abanda. The clay – eight centimetres thick – is put down on top of a wood base. The federation bought the clay from a Dutch company and it’s stored and can be re-used as it is being done this time after that Davis Cup tie against Finland in 2017. Watering only takes place once a day in the evening. Canada – Netherlands will be on Ziggo Sport television in the Netherlands and in Canada, starting on Saturday at 7 a.m. ET, on Sportsnet One with Caroline Cameron and Sharon Fichman handling the commentary. The 2019 Canadian Fed Cup team wore Collection Iris Setlakwe dresses to the official dinner on Thursday night at the Noordbrabants Museum in Den Bosch. Collection Iris Setlakwe was established in Montreal in 2001 and 90 per cent of her dresses are made in Montreal from fabrics imported from Europe. Her goal has been to simplify the wardrobes of business women and to create collections where items mixed and matched with each other. Collection Iris Setlakwe unique pieces are designed and produced for each season. Okker, now 74, also won the Canadian Open doubles title in 1978 with Wojtek Fibak of Poland at the new National Tennis Centre site at York University. 1990: It was a one-man show at the National Tennis Centre in Toronto as Grant Connell (left) of Vancouver won both his singles – over Mark Koevermans and Paul Haarhuis – as well as the doubles with Glenn Michibata over Haarhuis and Koevermans, to propel Canada to its first presence in the elite 16-nation Davis Cup World Group. 1995: Brenda Schultz-McCarthy, now 48, of the Netherlands, a former world No. 9, won the WTA event in Quebec City then known as the Bell Challenge and now as the Coupe Banque Nationale. 1999: On a Montreal night backed by a raucous hometown crowd, local boy Sébastien Lareau upset world No. 7 Richard Krajicek of the Netherlands 4-6, 7-6(4), 6-4 in the second round of the du Maurier Open – a.k.a. the Canadian Open. Krajicek, the 1996 Wimbledon champion, had done better the previous year in Toronto when he reached the final before losing 7-6(3), 6-4 to a red-hot Patrick Rafter who wound up going on to win both Cincinnati and the US Open that year. This picture is not supposed to look exceptional – it’s just that on Thursday we saw the sun after three days of gray, overcast weather in ’s-Hertogenbosch. It’s surprising what it does for lifting the spirits.